Gravely 7500 Watt Generator for sale in Larose - Houma - Thibodaux, LA. Neil's Small Engine Inc. 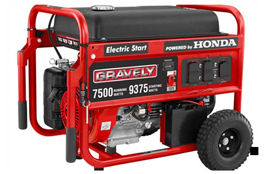 Whether you're tailgating, camping, at the jobsite or in need of emergency backup power after a storm, Gravely has you covered. This unit is 7500 Running watts with a surge wattage of 9375.